Even though I spent 20 years in education, my general knowledge is very limited. I’m great if you want to hear about fine art, classical music or Victorian novels. But life skills and knowledge are sketchy. The great thing about Danny and my old friend Ross Cameron is that they welcome any question. Ross always softened the blow and the fact that most people that I knew seem to understand a lot more than me. I can ask Danny anything too. He was the Childrens’ Encyclopaedia Britannica Kid. Read all the volumes from cover to cover. And remembers everything – very handy when I’m drowning in physics or just a simple question. Danny managed to keep a straight face when he explained that kippers are smoked herrings . I thought that sea fish must be automatically salty. With my laptop, I had access to everything that I wanted to know. I’m missing my laptop big time. I don’t watch TV so it’s my window on the world. This evening I discovered red spider mite on the runner bean plants. I sprayed them with a soapy organic spray but would normally have rushed back to the kitchen table to search on the Internet for the perfect cure. My laptop is still in intensive care. I dropped into the shop this afternoon and discussed the prognosis. It doesn’t sound good. The gentle guy recognised me although I was in my tatty decorating garb. I suspect that it will be Argos Ex Catalogue Clearance , here I come. We’ll have an answer on Monday. 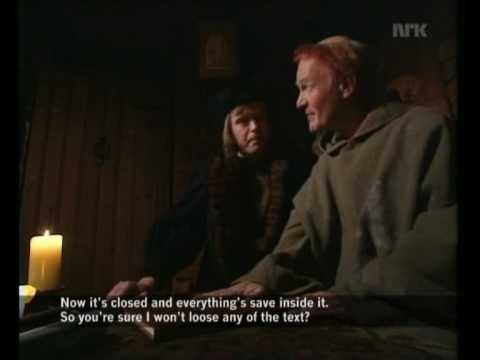 I so loved the medieval helpdesk clip – I used to work on a helpdesk. One of the funniest “fixes” I did was to walk round to someone’s desk, then crawl underneath and put the plug back into the electrical socket – truely! Good to know if the laptop can’t be revived at least all your work can be transferred to the successor. Zebbycat is snuggled on a wool filled quilt of the “Irish Chain” pattern, dear Mum’s work in Cream, Green and Purple. I know it is cold when this one goes onto our bed! That medieval helpdesk is hilarious…. thanks Fiona, you had me in stitches during an otherwise onerous & dull day. I hope they have a no fix no fee policy as most pc repair shops are meant to have! our laptop is a toshiba, bought reconditioned from dixons website. Posh boy works in IT so I dont question him when he says in a shop you will never use that programme, they are just trying to flannel you! I just stand there like an idiot as I do at the garage. bit like Margot when Tom and Barbara go away and she tries to make the sound of the generator. whhhhrrrrrr clunk. Classic. I couldn’t live without my laptop. Used to have all sorts of trouble with p.c’s but finally got a mac and in four years, not one worry. I know they are pricey but I was spending alot on p.c repairs every year. The advantage of a mac is that even when they put out major upgrades, they don’t abandon their old machines immediately. I think they wait around 5 years before making them obsolete. I wanted to say too, I found your blog by accident a few days ago and have been reading all of it. You do an exceptional job here and are inspirational. Thanks for sharing your life with us. Hubby decided that my computer needed upgrading a few months ago as my last (first) desktop was just so slow – mainly, it seems, from all the advertising graphics and fancy video links etc that people put on. I was reluctant. It took about half an hour for me to fall in love with my Dell vostro 200. Honestly, the speed is so impressive, as it is on hubby’s laptop. I have resigned myself mentally to the need to upgrade automatically every few years as technology improves. This hurts, as I am essentially a pencil and paper girl at heart! i got my lovely laptop from tesco. £199. its not (touch wood)had one hint of trouble and i smash the poor little bugger about alot. My knowledge on fish and ocean fishing is scetchy at best too. Don’t worry, you don’t make a living from it. I would be lost without my laptop too. It is not just my window on the world and a wealth of information but the way I keep in touch with my children since they live in England and I live in Latvia.